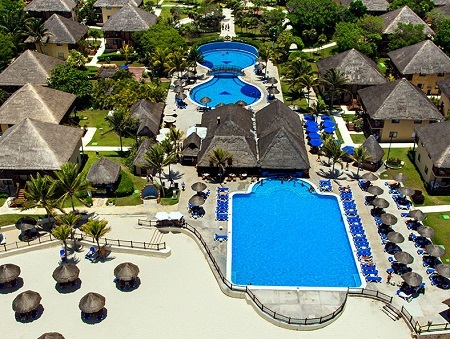 All Inclusive Allegro Playacar Resort in Playa Del Carmen, Mexico! Bid Per Person Per Night & Choose Your Length of Stay! in Playa Del Carmen, MEXICO! Imagine that you're relaxing on a lounger, staring out at turquoise Caribbean water. Your toes play delicately in soft, white sand. All around you tropical birds sing in the green treetops of an ancient rainforest. This is what it's like to visit Playa Del Carmen, an idyllic beach located one hour south of Cancun that's home to one of the country's best All Inclusive vacation destinations: the hotel Allegro Playacar Resort****. Guests of the Allegro Playacar Resort not only get to enjoy the unforgettable natural surroundings of this special part of the Yucatan coast. 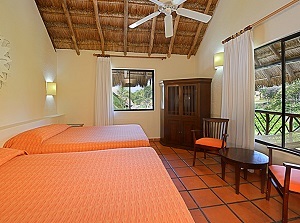 They also get to take advantage of the luxury and comfort of the best hotel in Playa Del Carmen. Moreover, guests who participate in the all Inclusive package enjoy unlimited access to meals and snacks from three of the resort's premier restaurants and five of its bars. 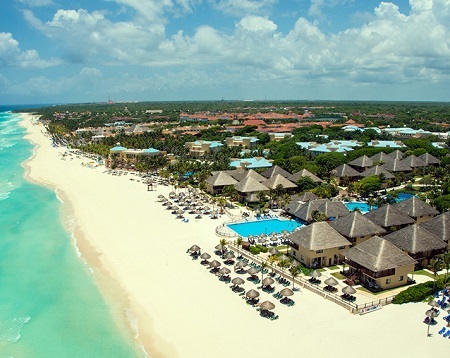 All Inclusive guests also receive complimentary access to activities like beach volleyball and windsurfing. In addition, the resort's location is convenient to important cultural sites like the archeological area of Tulum, which features breathtaking, seaside Mayan ruins. 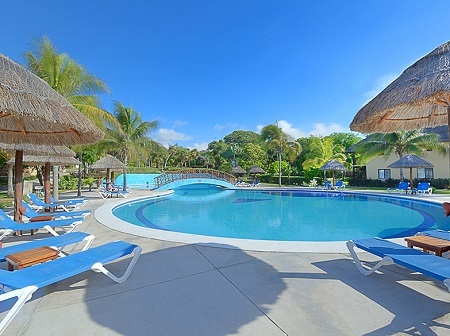 Its magical natural setting is just one of the aspects that make the Allegro Playacar Resort one of the most popular Playa Del Carmen resorts. Guests also rave about the state-of-the-art exercise facilities, the excellent restaurants, the magnificent pools and the comfortable, spacious rooms. With the All Inclusive package, guests truly have nothing to worry about except relaxing and enjoying this beautiful destination. Whether traveling with the family, enjoying a romantic getaway, having fun with friends or celebrating a magical life event like a wedding or an anniversary, the Allegro Playacar Resort offers an unforgettable experience in one of the most beautiful places in the world. 4 bars and Sports bar. The Buffet: with a large selection of international dishes. Offers guests a daily themed night. The Mexican: authentic a la carte Mexican restaurant. With the best variety of traditional Mexican dishes. Reservations required. 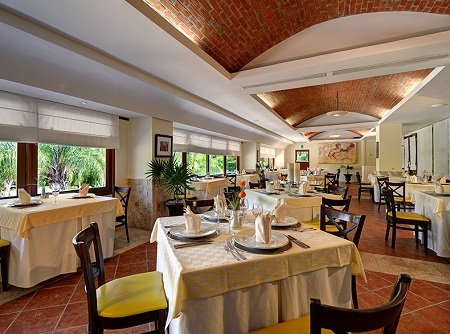 La Trattoria: offers a special menu with the best dishes of Italian cuisine. A la carte. Pizzeria: a large variety of fresh and just out of the oven pizzas. Snack & Grill: offers a large variety of light snacks, hot-dogs and hamburgers. The Allegro Playacar Resort, with its colorful rooms, allows its guests to experience an authentic vacation in a comfortable atmosphere. Whether traveling as a family or with friends, the Caribbean-style bungalows with thatched roofs surrounded by tropical gardens offer all types of comforts to ensure that guests have a comfortable, happy stay. Featured Services: front desk open 24 hours a day, concierge service, Wi-Fi Internet connection (additional charges apply), laundry service (additional charges apply) and babysitting service (subject to availability and additional charges apply). These 279.9 ft² rooms feature a king bed or two double beds. All rooms have a balcony or terrace and are located close to the pool and/or beach. Single Supplement: Offer is based on double occupancy, single supplement of +$75 per night is available for those traveling or rooming solo. Single parent staying with children must pay the Single Supplement and Child rate. Tax and service charges of $49.oo per adult per night are additional. An Environmental Sanitation Tax 'eco - tax' in the amount of 20 Mexican Peso per room per night is no longer included with your reservation and will be collected at check -in by the hotel. All Reservations must be requested by noon est. on August 31st, 2018!